Wings Lounge NAIA 3 is the nearest possible place to relax or have a nap when in Manila International Airport. We had often read about Wings Lounge NAIA 3. We even provide a link in our Manila Airport Transfer page, but we have never tested this facility. Our recent travel to Indochina with awful flight connection made us try this lounge. Warm Greetings from The Wings Transit Lounge! We appreciate your interest in our services. Please be informed of our standard time schedule for prior reservations (08:00am- 03:30pm | 04:00pm- 11:30pm | 12:00mn- 07:30am). Late check-in will not adjust the check-out time. Extension hours may be applied afterwards. Should the time is outside your schedule, you may proceed at The Wings as walk-in guests and book the rooms directly as it doesn’t apply the time schedule. Rooms and seats will be subject for availability upon your arrival. This first schedule wouldn’t have been a big problem for us, we would have killed the waiting time by going to the Mall of Asia (MOA). On our return journey we arrived at 2:30 a.m. in the morning. Then we would really have liked to be sure to have a bed reserved. We therefore strongly recommend that Wings Lounge NAIA 3 thinks about more flexible reservation schedules. We arrived at 1:00 p.m. in NAIA-3. Then we directly went to the Wings Lounge on 4th floor and were welcomed with a warm smile. I asked for a Twin Room and got one without any problems. When walking through the hallway, I saw that about 30% of the rooms were available (door open). Invisible on this picture is the small stand alone air-conditioner on the right side. The beds are exactly 6 feet long and about 3 feet wide. A bit too short for me. The mattress is comfortable, but the blue woolen cover is definitely too short. There are 3 lights in the room: a rather dim general light and two small pin reading lamps over each bed. This lights are perfect, you get exactly what you need. The ladder two the upper bed is steep. Climbing is rather easy, but getting down needs a bit gymnastics. The space is really small. I estimate 6 feet long, some 6 feet wide and about 8 to feet high. This rooms are definitely not recommended for people with claustrophobia. On our first stay we also had our 2 big suitcases with us in the room. For another solution read our second experience. My wife who didn’t sleep this first time, told me later that she experienced strong and fast WiFi. Toilets and showers are shared. They were clean and well maintained on our both stays. After a wonderful journey through Vietnam and Cambodia, we arrived at 2:30 a.m. in the morning again in NAIA-3. Tired, we went directly to the Wings Lounge NAIA 3. Again we were welcomed with a warm greeting and had no problem to find a free Twin Room. The front desk staff told us, that we can leave our luggage on the trolley outside of the lounge. The push carts are covered with net and are monitored by the lounge staff. After a warm shower in the really clean facilities we found a good sleep. I woke up at 7 a.m. because my stomach demanded something to eat. The Wings Lounge NAIA 3 offers a self-service buffet. The coffee machine easily prepared a good coffee for me. Unfortunately neither the fruit basket nor the sandwich box had been refilled yet. Also the refrigerator offered a sparse choice. This missing items might be due to the early morning hour or a gang of hungry wolves that passed just before me. After again a warm shower I checked the “business center”. I set “business center” in quotes because 2 PCs and a printer are just a “computer corner”. The facility is working and does its assigned job – just center is a bit a too big word. WiFi is available and has a strong signal throughout the lounge. Speed is good (for the Philippines) and the WiFi is free for guests. The Wings Lounge NAIA 3 offers other types of rooms, family room with 4 beds and capsule rooms. They also offer services such as lounge, foot spa and massage. Please visit their official website for more information. 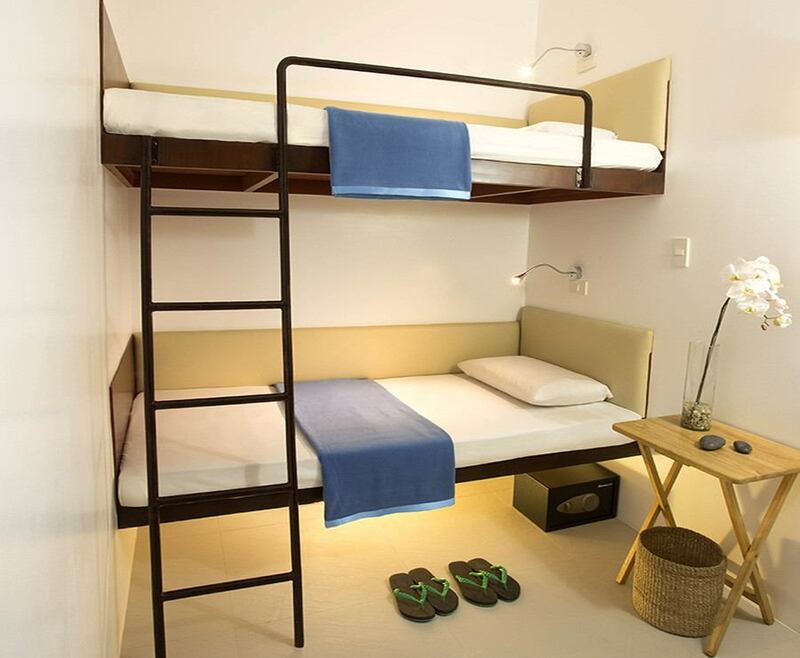 PHP 1,800 for 7 hours sleep, relax and shower and some 36 square feet (roughly 3.5 square meters) of space. Up to you to judge. Do not forget that you sleep in an international airport. We have already slept in the Radisson Blu in Zurich airport. The rate was over PHP 12,000 for one night. But this hotel is another class. The first time we found the rate in NAIA-3 absolutely OK. But the second time we came directly from Siem Reap. There we had paid PHP 1,720 for a spacious room in a 4 stars hotel. They left us the wonderful room for free during the whole last day. We checked out at 7:30 p.m. So we were slightly shocked about the price in NAIA-3. You see, everything is relative. Our bodies and souls had been happy to sleep, relax, and recover in such a convenient place. We can sincerely recommend this lounge. All pictures in this article are courtesy of “The Wings Manila”. Thanks for the great info on transfers in NAIA. I’m wondering if the Wings lounge is actually inside the terminal, or if I can stay there without either arriving at or departing from terminal 3. I arrive at terminal 1, and my friend I’m meeting arrives at terminal 3, then we both fly out of terminal 4 the next day. Will I be able to get in and stay there without a terminal 3 boarding pass? Cheers. The Wings lounge is inside terminal 3 on 4th floor. Fortunately everybody can get into terminal 3 after having passed a security check at the entrance on ground floor. In other words: You and your friend are OK at Wings. Hi! Thank you for this review, I appreciate this because I was looking for a place to work while my husband and I wait for our connecting flights. I’m surprised there is this space available at the NAIA. Though I don’t use the airport often. Your fine travel blog is now bookmarked! I like your style of writing. Would you also know a convenient (and affordable) transfer from NAIA 2 to NAIA 3? But we have a domestic flight after <12hours, via AirAsia. Thanks a lot ^_^ God bless..
Use the air-side shuttle bus. It is free for passengers with a connecting or on-going flight. Ask the PAL ground staff at your arrival. Sometimes the shuttle-bus is crammed full or it has just left your terminal. Then we recommend to take a taxi. The yellow airport-taxis aren’t expensive. From NAIA-2 to NAIA-3 it will be about 150 Pesos. From NAIA-3 to NAIA-4 it might be just 100 Pesos. But ask first for the bus.